Autumn has officially started, even weather is showing signs of change in England. Trees are changing colour, it doesn’t feel like summers anymore. There is a nip in the air, the cool touch of the breeze silently whispers and says it’s that time of the year again!! Autumn is a transition period for me where I say goodbyes to the summer days with a heavy heart. It’s a change that happens every year though but the mind plays its own games. This season definitely calls for something warm and comforting, and a bowl of steaming lentils is a good start for this transition, I suppose. 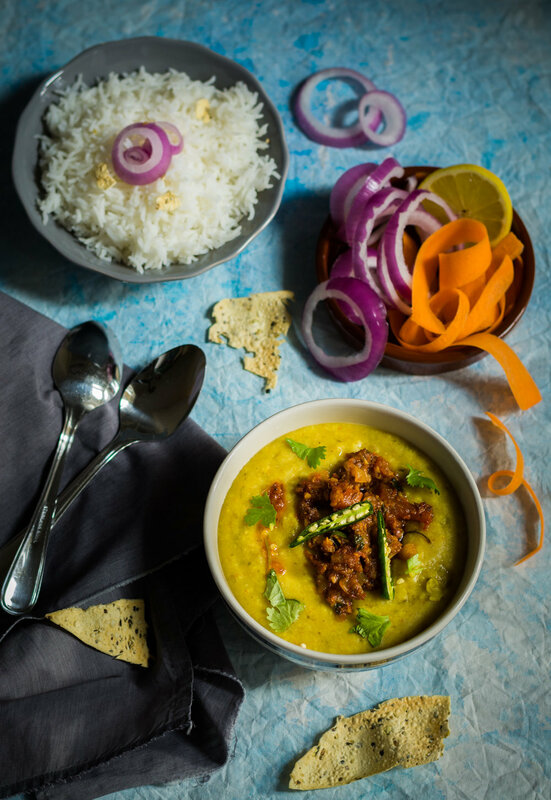 This dal recipe is what mum used to make quite often at home for lunch. Paired with a bowl of steamed basmati rice and some Indian accompaniments of papad, pickle and yogurt, this was one of the most loved. Simple, filling, comforting and without a doubt, full of flavours!! Indian food uses lentils extensively and not just one kind, there is a huge selection of beans and lentils. These are then cooked in all sorts of different ways depending on the region you are. This dal is cooked in a North Indian style with a nice spicy tadka and a kick of green chilli just tantalises the taste buds. I tried to be a bit clever and added curly kale while making this dal. I found this gorgeous kale at my local greengrocers and the moment I saw this beautiful fresh produce my head started buzzing with ideas to use it in my food. Oh, I so love cooking with fresh ingredients!! Although, I have used pressure cooker here, this can be made easily in instant pots or slow cooker. I have also used a spice blend (Mix Masala) in this recipe. This is a very fragrant spice blend and I use it often with dals. It’s easy to make at home and you can find the recipe here. Its optional but I would recommend using it, as it does lift the taste of the dal significantly. In a pressure cooker add mung beans along with arhar and red lentils, 1 tomato, kale, asafoetida, turmeric powder, salt and water. Bring it to a boil and then close the lid. Pressure cook the lentils for 5 minutes on high heat and then 15 minutes on medium. In the meantime, heat oil and ghee in a separate pan. Quickly add cumin seeds to the hot oil and as soon as it swells and start changing colour, add the shallots and fry for about a minute until translucent. Reduce the heat to medium. Now add ginger and garlic and sauté for a few seconds, take care not to burn it. Add the tomato and sauté for a minute or two and then add all the ground spices, and sauté again finally for a minute. Take off the heat and add this to the dal. Drizzle some ghee, garnish with coriander and green chilli halves, serve hot. Every dal has its own taste and although you can substitute with any dal, but the taste may differ. Green chilli is optional. Omit these if you prefer it to be mildy hot, instead use padron peppers. For a completely plant based recipe, use oil instead of ghee.